New Life Church's worship band has gone mainstream. Well, sorta. New Life Worship's music is still as Christian niche as ever, but the band's new CD -- My Savior Lives -- will be available nationwide at a little chain called Wal-Mart. Though the CD was recorded last spring -- well before New Life lost its founding pastor, the Rev. Ted Haggard, in a headline-grabbing scandal -- interim pastor Ross Parsley believes the CD touches on some of the church's trauma and recovery. "I believe that the powerful work the Holy Spirit did in our church that night back in 2006 was somehow captured in ones and zeroes and put onto this CD, and now the largest company in America is helping spread that incredible experience across our country," Parsley said in an e-mail to New Life congregants. The CD is spreading for $14.98, by the way -- or $12.88 at the Wal-Mart web site. 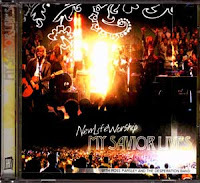 Word has it that My Savior Lives is already New Life Worship's best-selling CD--after just four months released. Considering all the CDs the group has had over the years, clearly the songs are striking a chord.